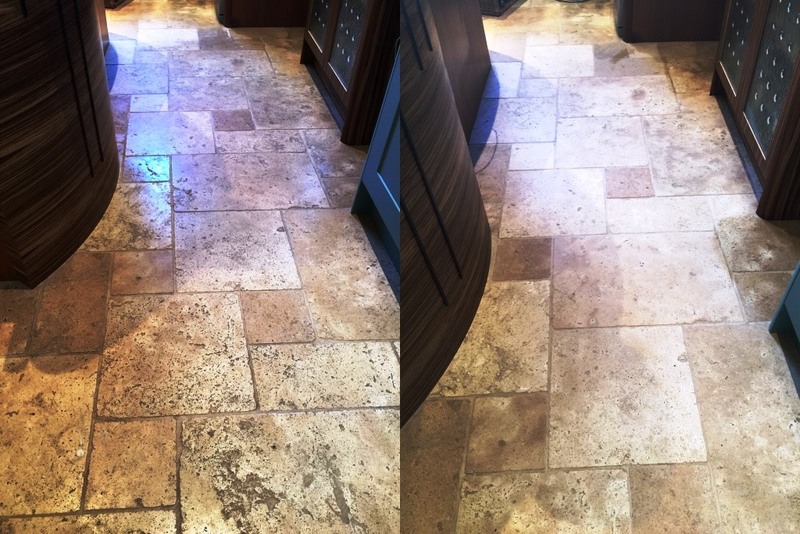 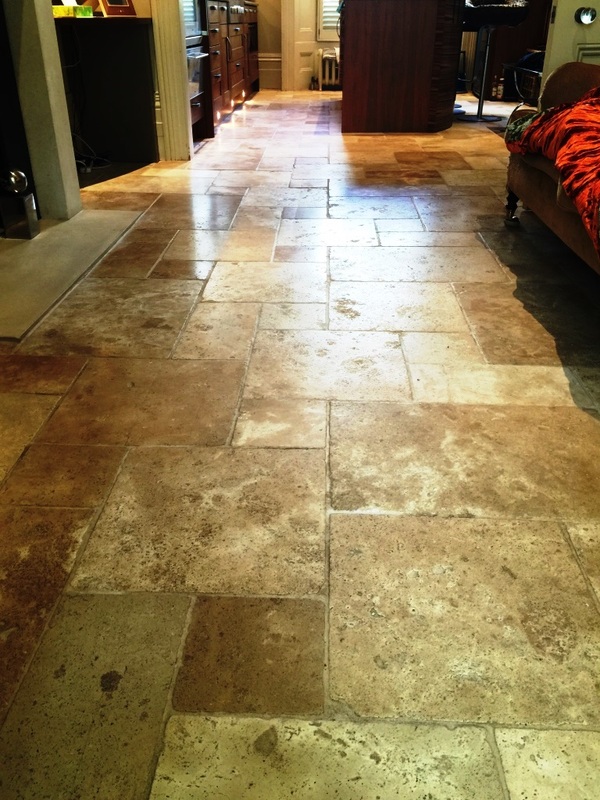 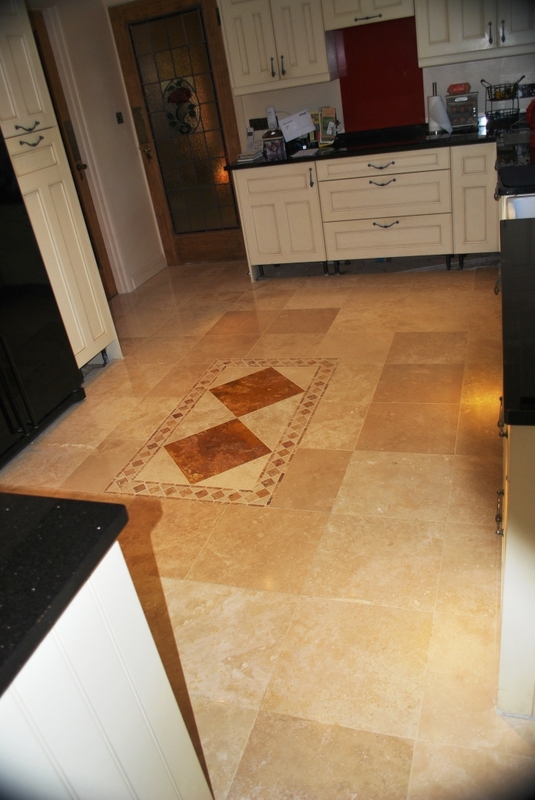 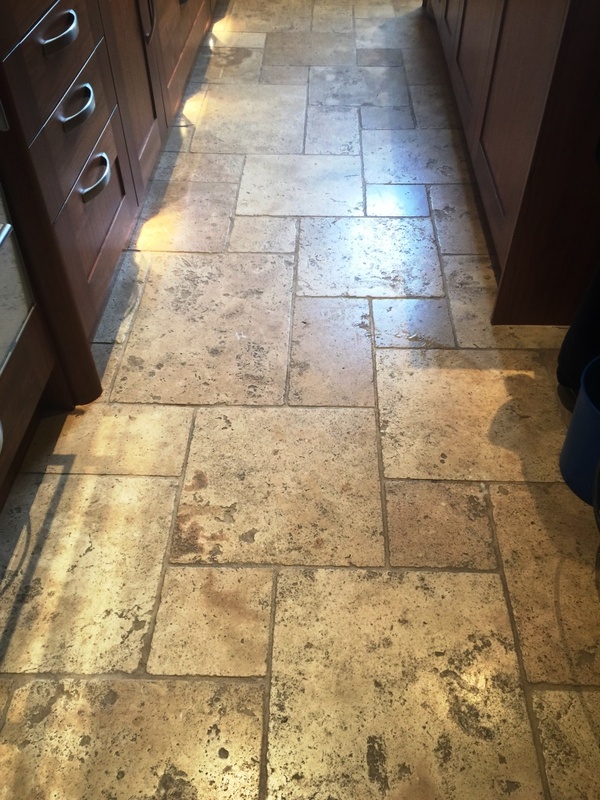 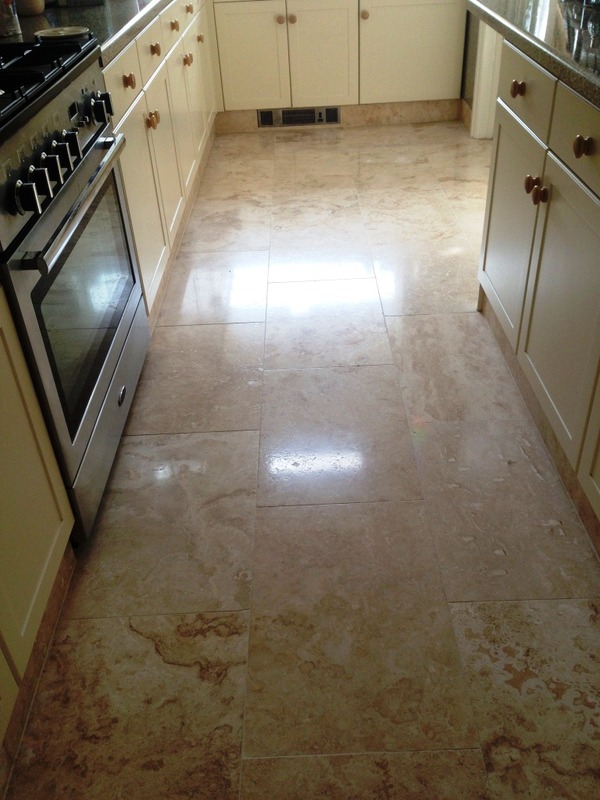 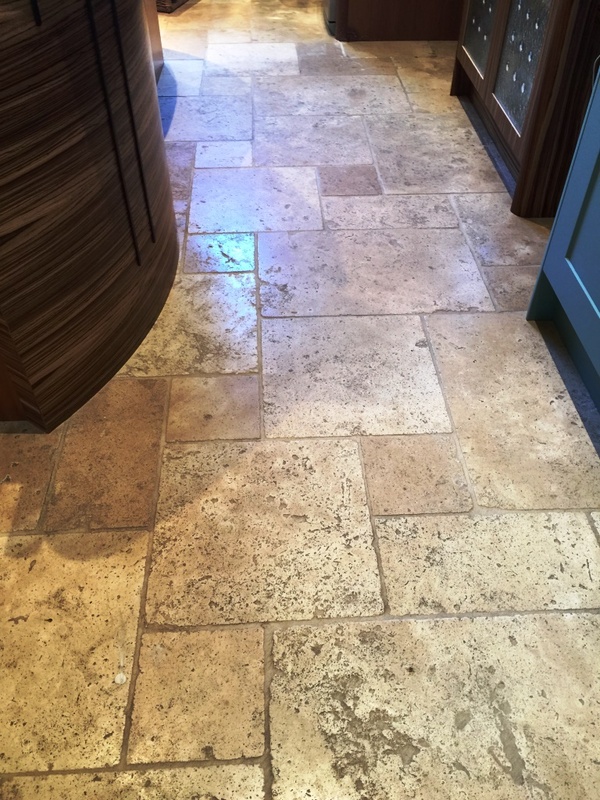 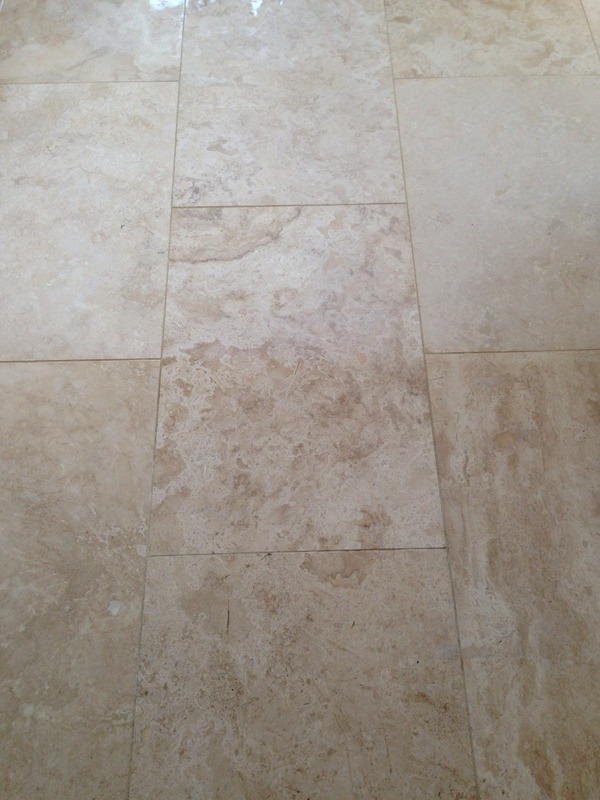 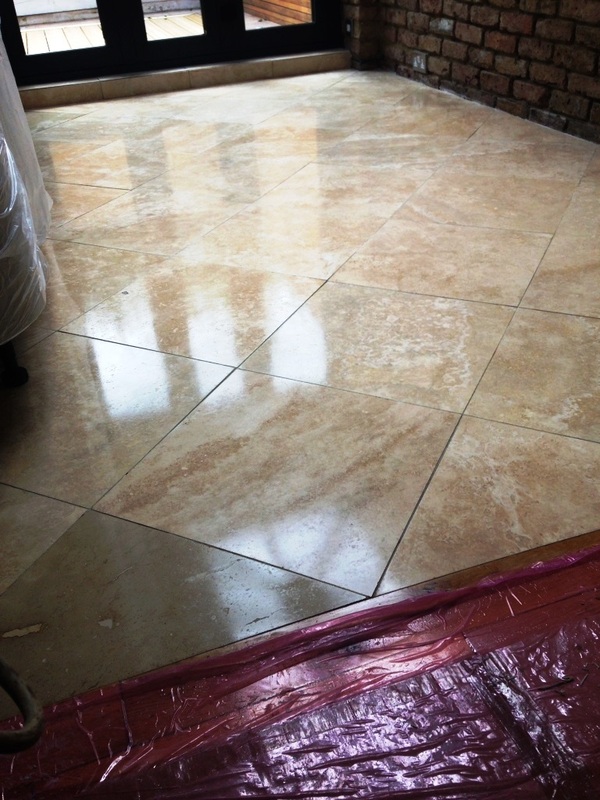 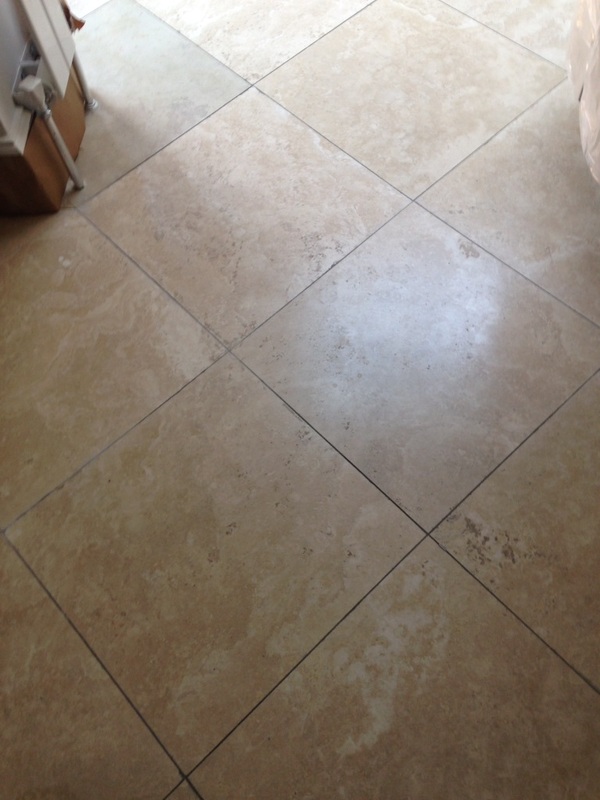 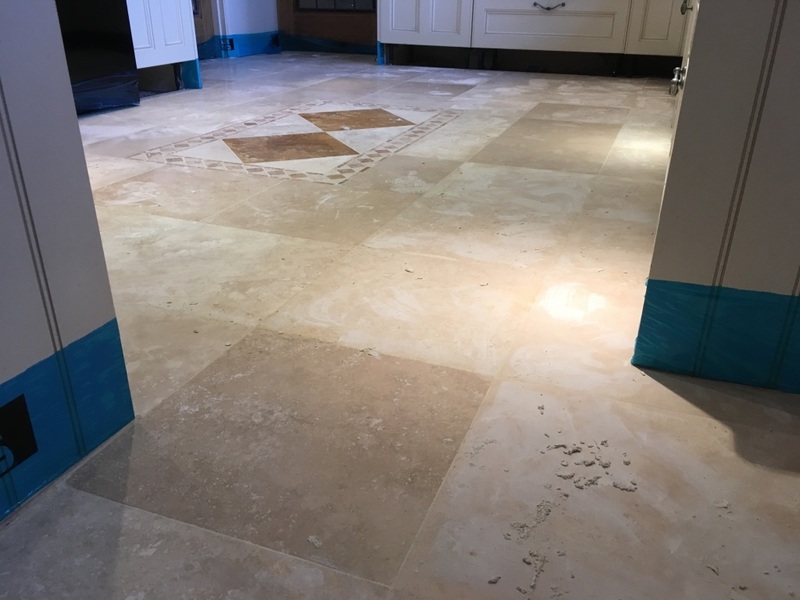 This Tumbled Travertine tiled floor at a beautiful house in Horley had been poorly maintained through the years using the wrong type of sealer which quickly wore down allowing dirt to become ingrained in the stone. 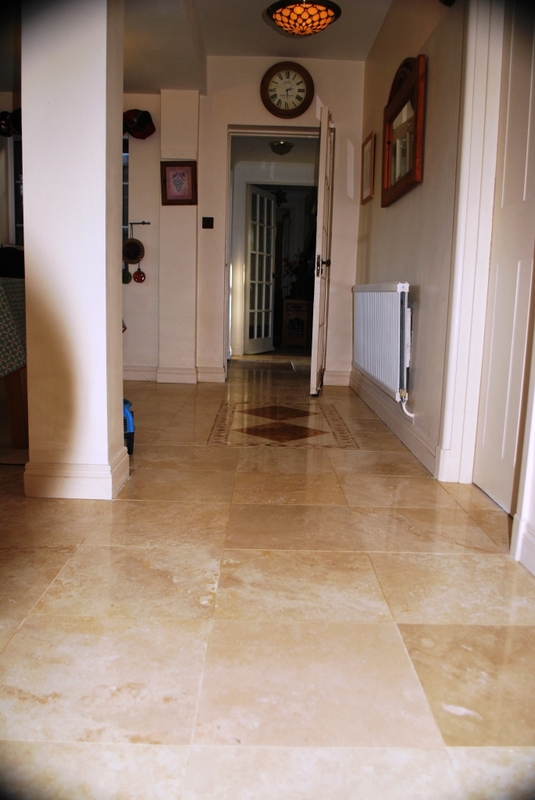 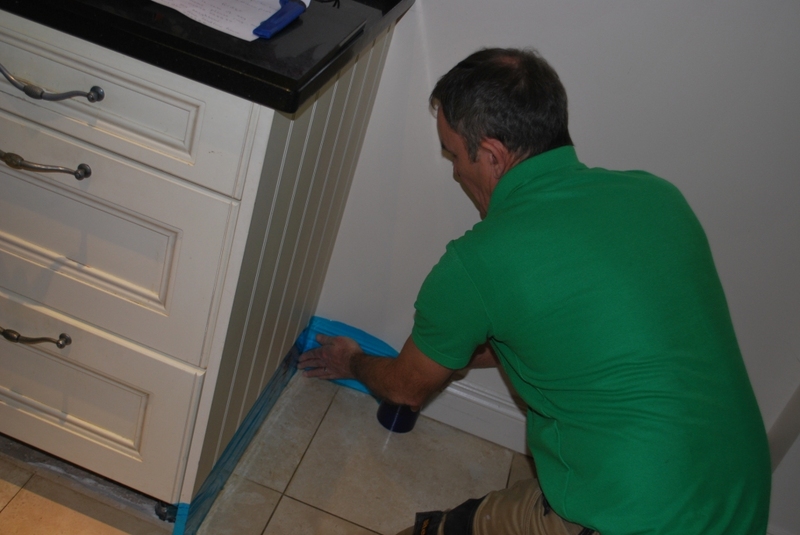 The owner had become concerned about the state of the tiles and decided it was time to call in an expert that could restore the tiles to a condition that complimented the environment in which it was situated. 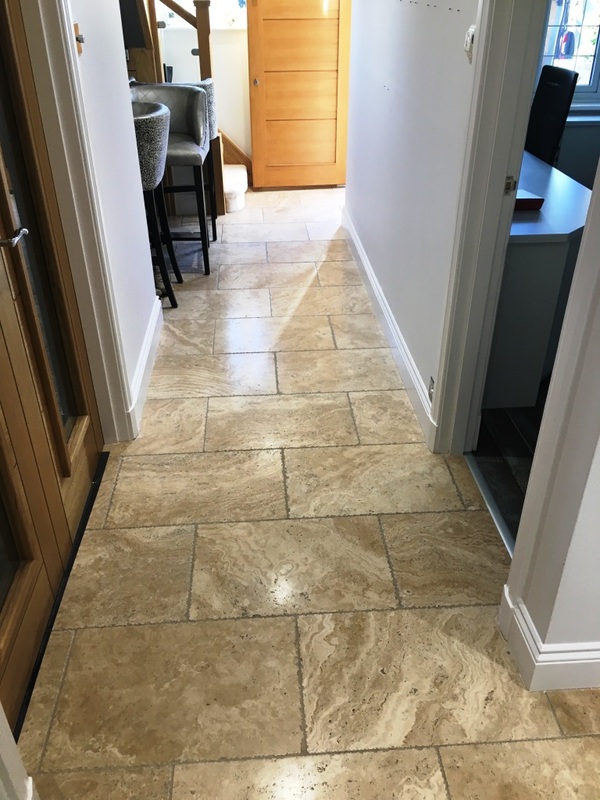 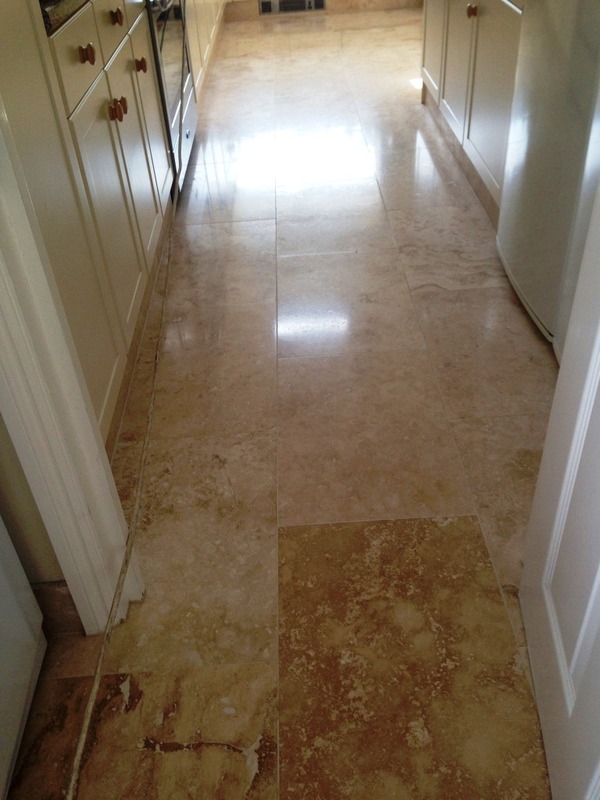 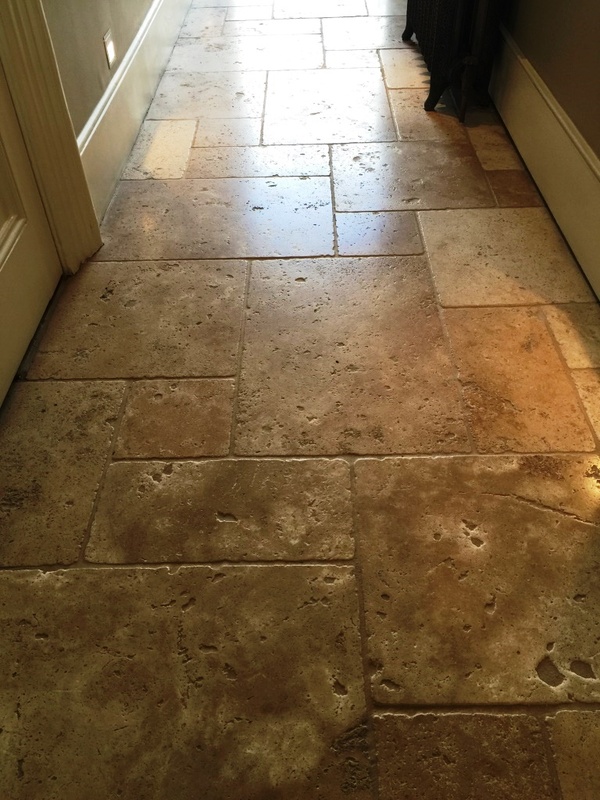 Travertine is known for being very distinctive in character and very durable, making it a very popular choice for tiled flooring in properties worldwide. 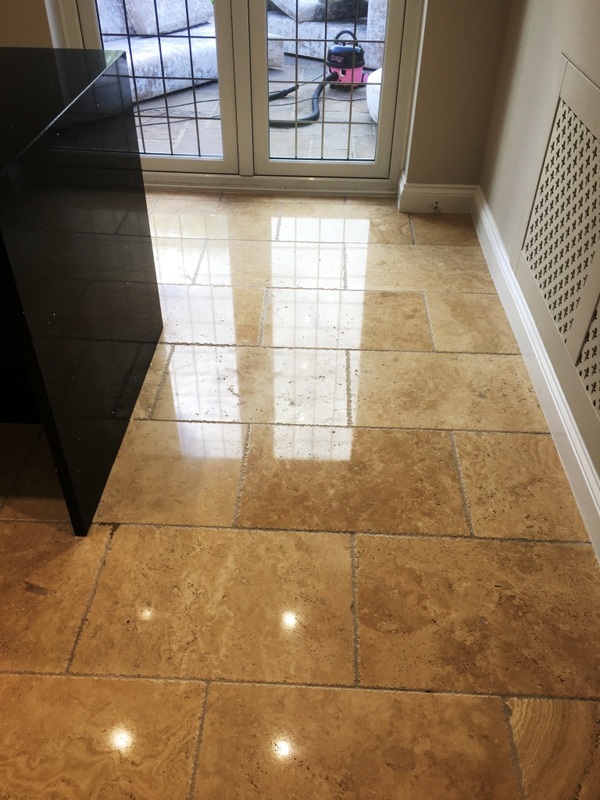 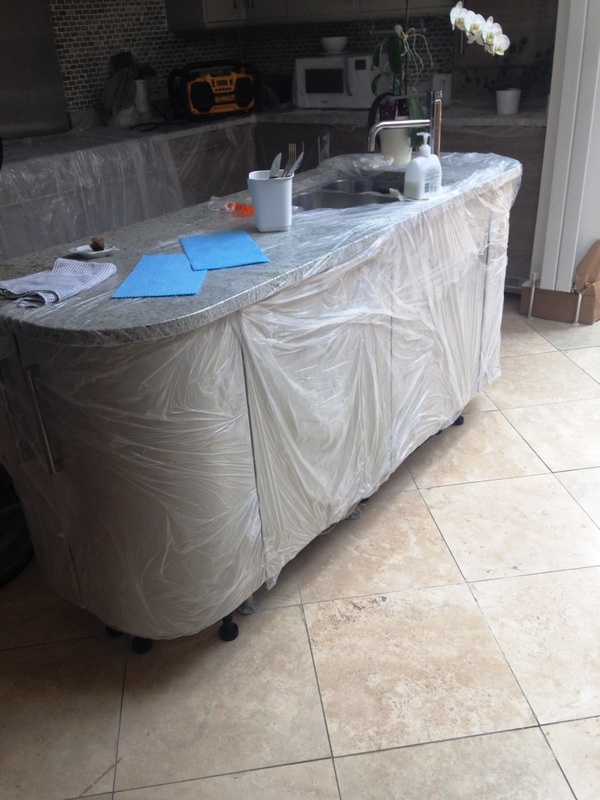 However, the stone does require regular professional maintenance and polishing to keep it looking it top shape and home owners rarely realise this when they decide to have it installed. 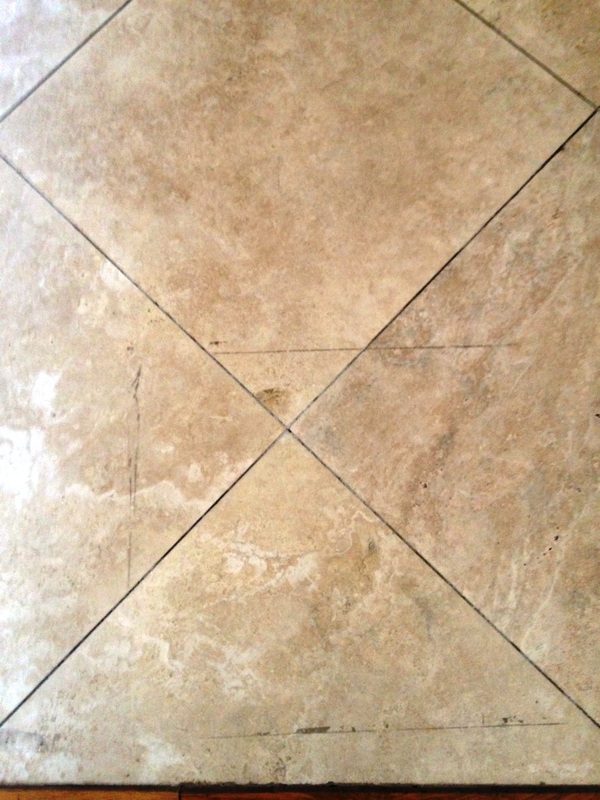 Fortunately, in the UK at least you can rely on your local tile doctor to maintain it for you. 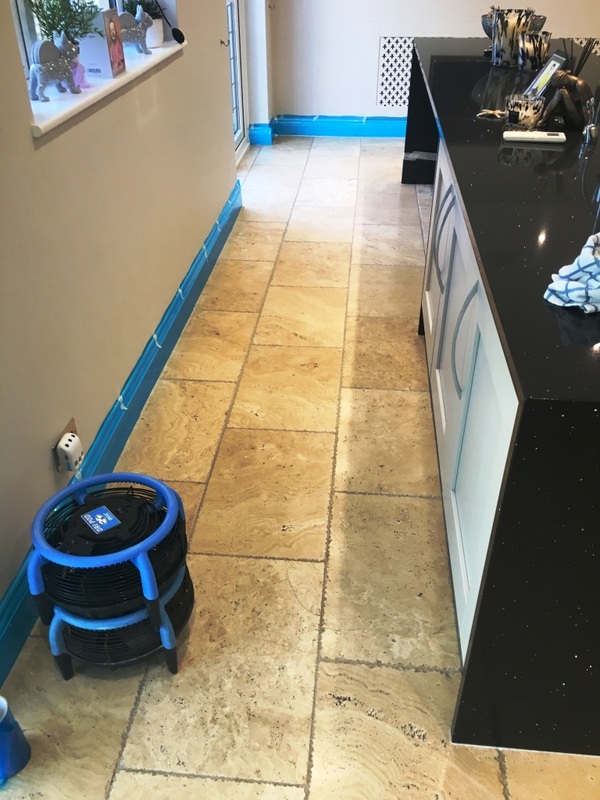 The first part of the job involved giving the floor a thorough clean to remove what was left of old sealers and any polishing compounds that remained on the floor. 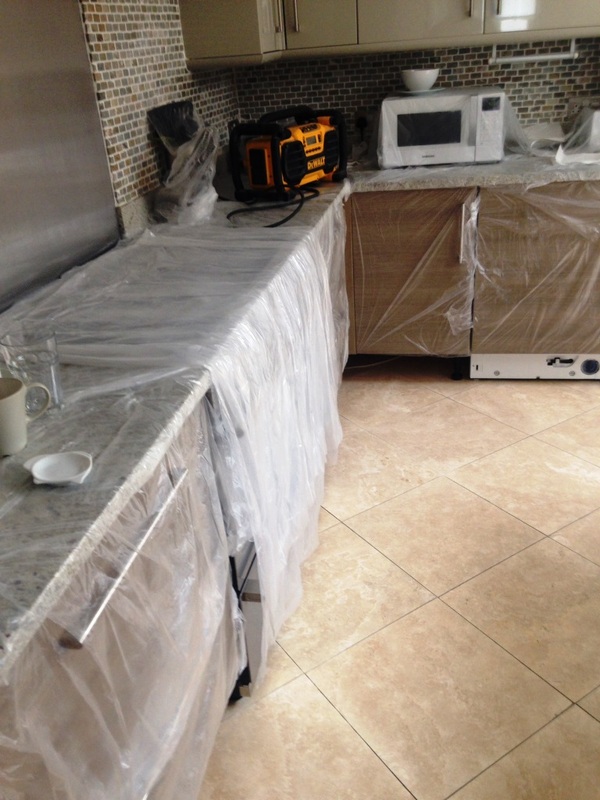 Before beginning that however I brought in all my equipment and products into the house and then prepped the area by taping up the woodwork to protect it during the renovation process. 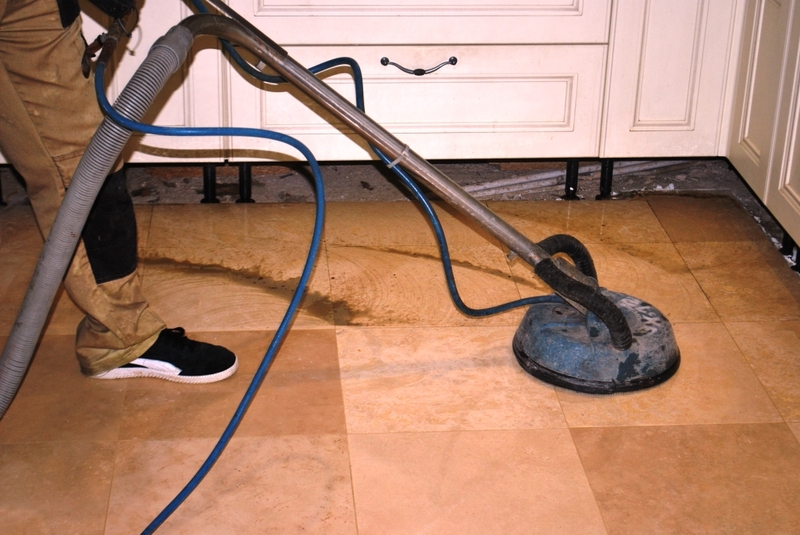 To remove what was left of the old sealers and other coatings still present on the floor a strong solution of Tile Doctor Remove and Go was applied to the floor and left to soak in for about ten minutes before being actively worked in with a rotary machine fitted with a black scrubbing pad. 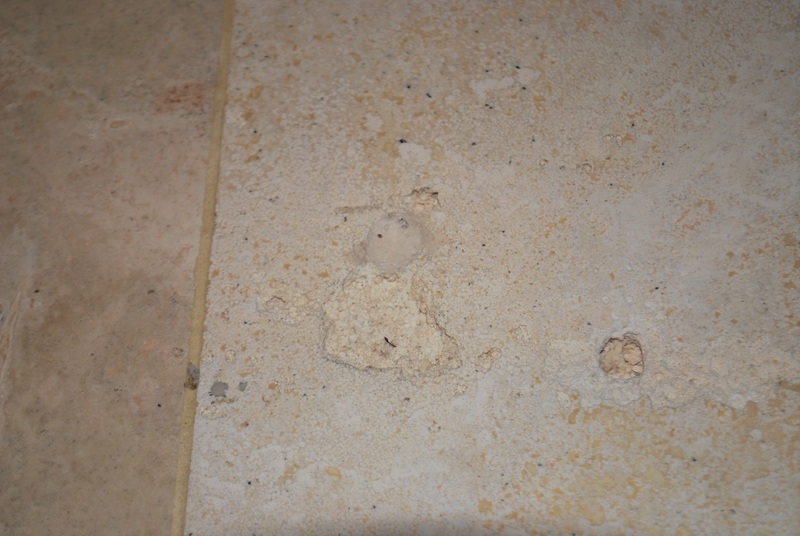 The solution turned black with the soil as it was lifted out of the pores of the stone and it was then rinsed off with water and extracted with a wet vacuum. 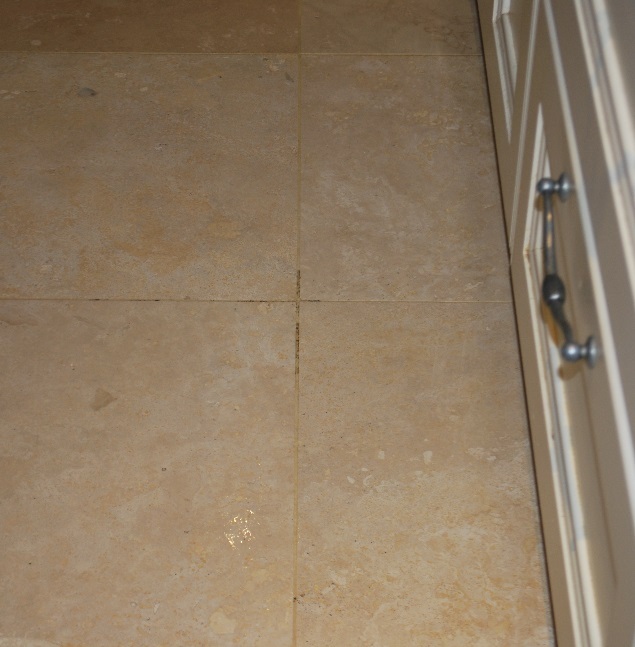 Following this, we moved on to a process we know as burnishing that hones the stone and brings up the polished appearance. 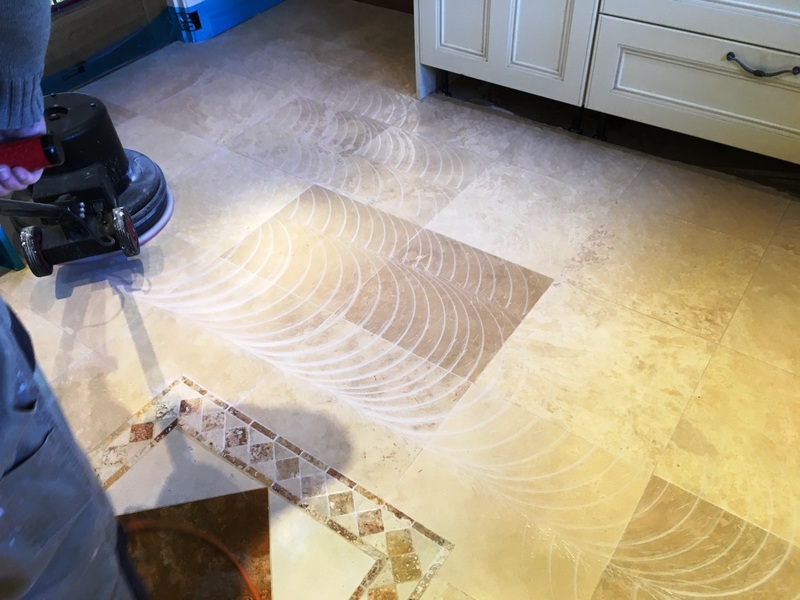 Working in sections due to the size of the floor It involves the application of a series of diamond encrusted burnishing pads from coarse through to very fine. 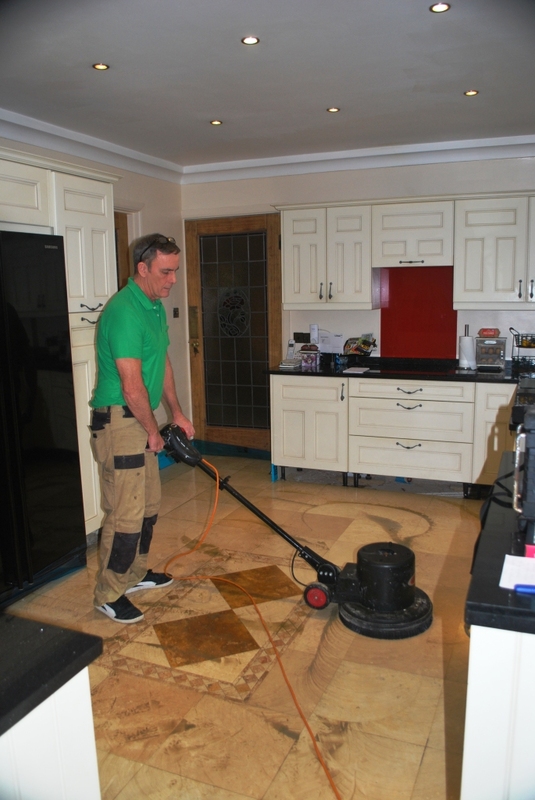 The coarse 400-grit pad fitted to the rotary floor buffer and run over the floor using only water for lubrication. 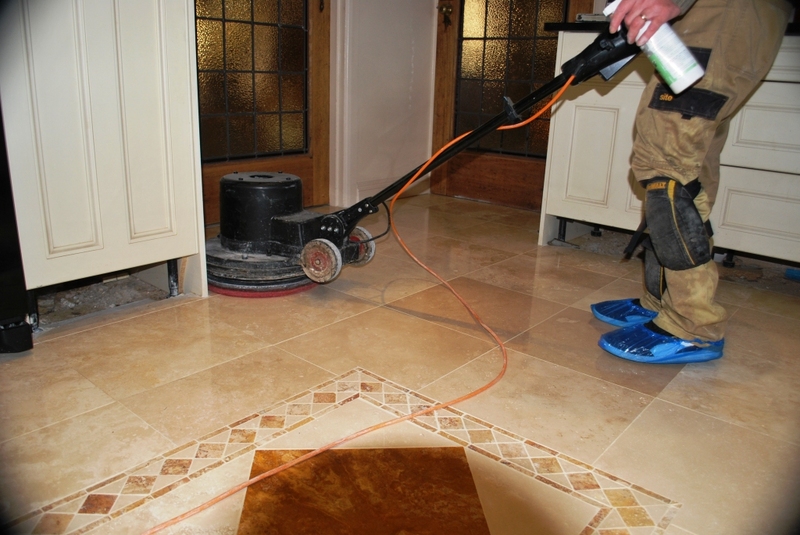 The water turns into a slurry as the pad does its job removing dirt and this has to be rinsed off the floor and extracted with the wet vacuum before applying the next pad. 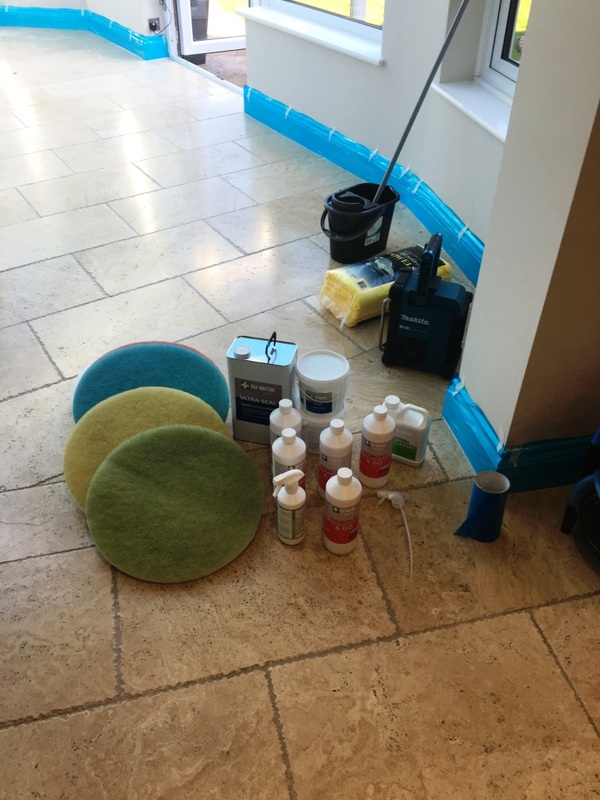 The process was then repeated with medium 800 grit pad for an initial polish followed by the Fine 1500 grit pad for the second polish using water for lubrication and rinsing and extracting in between each pad. 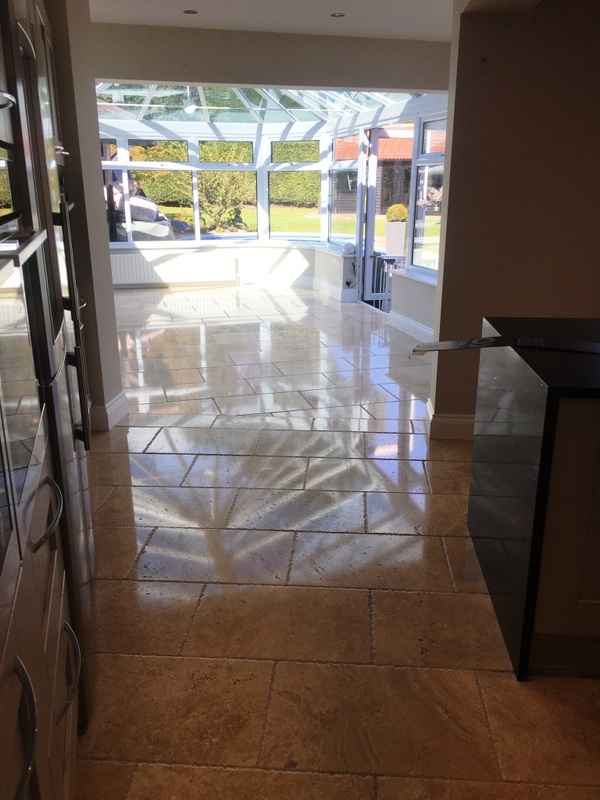 The last pad is a very fine 3000 grit pad for the final polish and is applied with only a little water sprayed onto the floor using a technique we call a Spray Burnish. 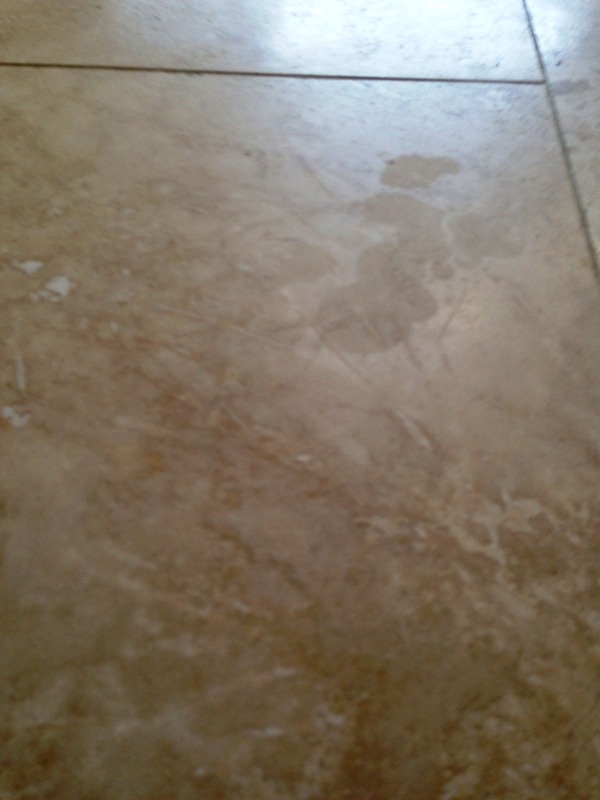 This last pad really brings up the polished appearance of the stone. 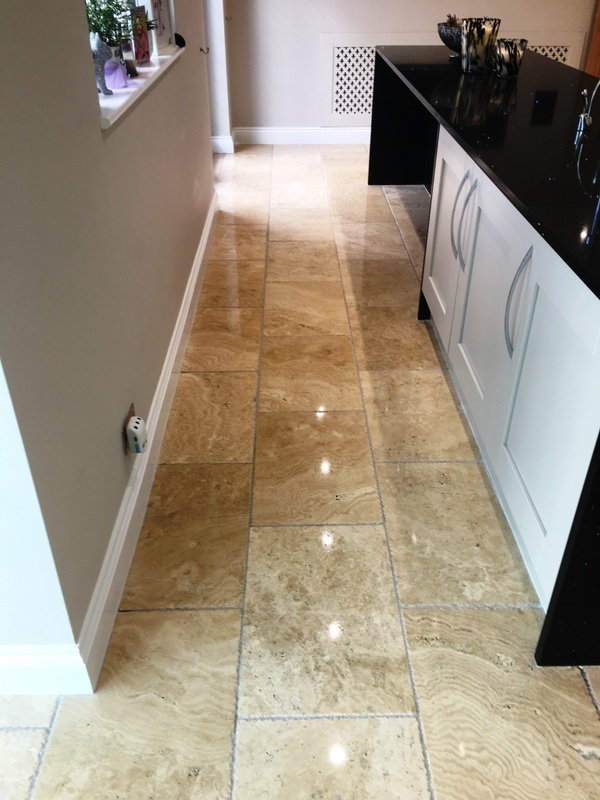 To bring up the appearance of the stone even further and add a really durable polish Tile Doctor Shine Powder was applied. 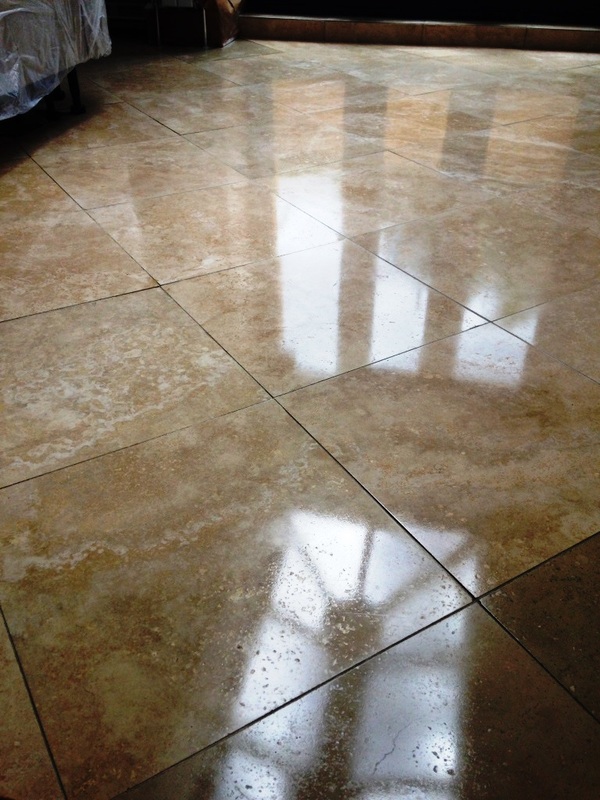 This is a crystallising powder sealer that ensures a very high shine and a tough, durable finish. 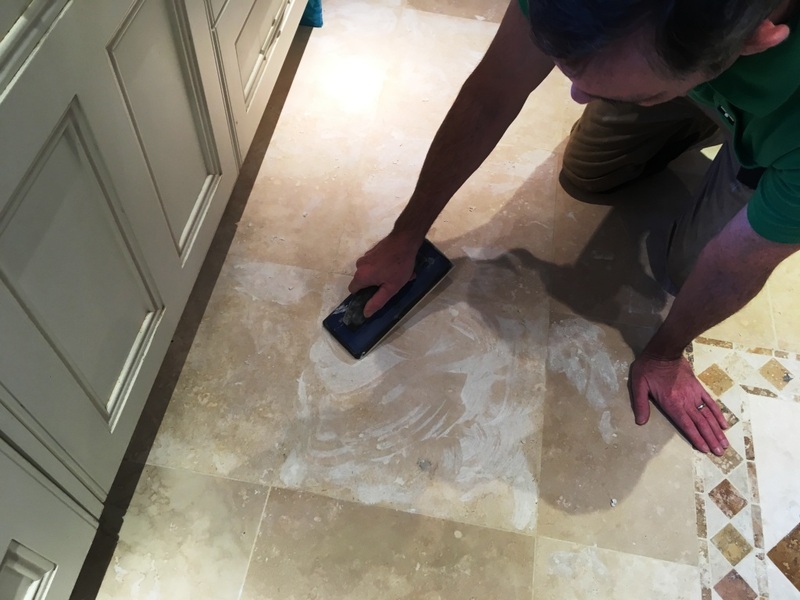 This powder is applied directly to the tiles in combination with approximately ½ a litre of water and a soft white buffing pad. 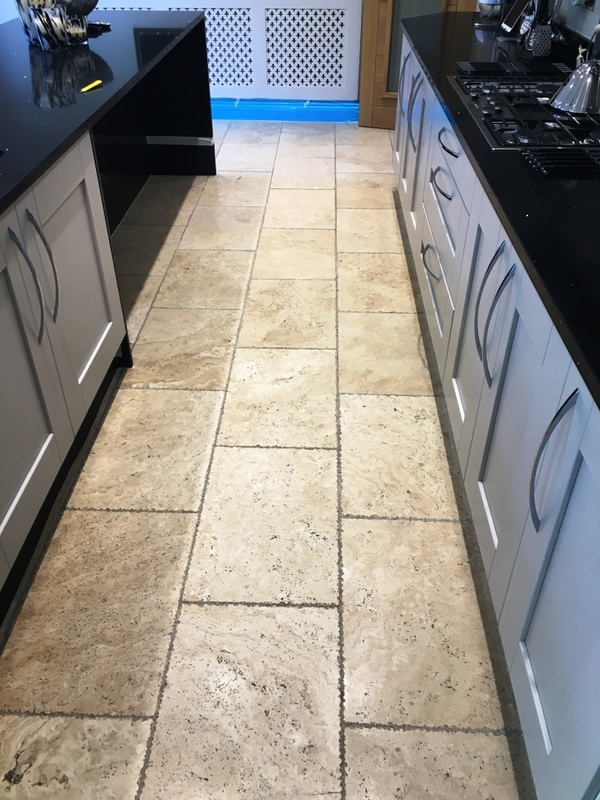 Last step was to add to the protection provided by the Shine Powder with two coats of Tile Doctor Ultra-Seal which is a natural look sealer that doesn’t change the look of the stone and is applied to the stone and grout. 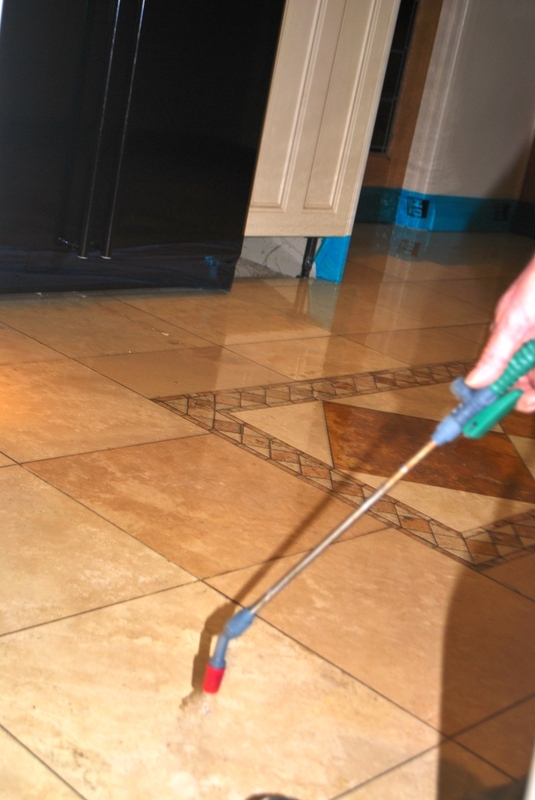 This sealer works by seeping into the stone, occupying the pores and preventing dirt from becoming ingrained.